The production of non-durable consumer goods has shown a high growth rate of 25.1% in 2009-10 so far, while non-durable goods have grown at a sedate 6.4%. Some of it is due to a base effect, as durable consumer goods grew at a mere 3.9% in 2008-09. But then, the growth of non-durable consumer goods in 2008-09 was even lower, at 1.2%. Why the divergence? One reason could be the drought of 2009-10, which resulted in food inflation, which must have crimped demand for basic consumer goods. 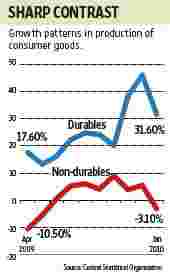 But the drought doesn’t explain why the growth in consumer non-durables was so low in the previous year. “While the increase in government welfare and infrastructural expenditure on the rural areas would help to offset this decline, the expansion of rural jobs does not fully counteract the impact on demand of the loss in urban jobs: monthly per capita expenditure in the urban areas is almost twice that of the rural areas. (The government has talked of launching an urban employment scheme, but this has not materialized.) Thus, growth in non-durable consumer goods has been significantly lower than the overall growth in the IIP (Index of Industrial Production) and far lower than the durable consumer goods (two-wheelers, cars, refrigerators, air conditioners, TV sets, electric fans, etc.)." There are also several reasons why consumer durables did so well—the stimulus packages, the low interest rates that pushed auto sales and the Sixth Pay Commission arrear payments that might have been used to buy durable goods. Analysts say that personal and home care product makers, too, have seen a deceleration in volume growth, partly due to food inflation. But Hazari says that the poor at the bottom of the pyramid do not buy the products of companies tracked by equity analysts. The data does seem to show that the recovery is yet to be a reality for the masses.